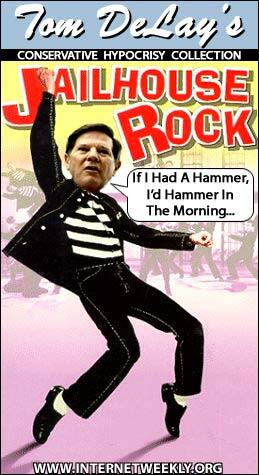 “A judge ordered former U.S. House Majority Leader Tom DeLay to serve three years in prison Monday for his role in a scheme to illegally funnel corporate money to Texas candidates in 2002. The sentence comes after a jury in November convicted DeLay on charges of money laundering and conspiracy to commit money laundering. DeLay was once one of the most powerful men in U.S. politics, ascending to the No. 2 job in the House of Representatives. Another corrupt Republican bites the dust. That is just the type of talk that should make Delay the most popular twinkle-toes in Cell Block D. Think any of his new inmate boyfriends will be interested in seeing how he performs the “Horizontal Bop?” Will they be viewing this video before he checks in to his new home? In honor of the troops, please remember to click on the song link below to familiarize yourselves with the tune and to have more fun singing along with today’s song parody. Posted on January 10, 2011, in Republican, Songs, Tom Delay and tagged Dancing With The Stars, DWTS, Elvis Presley, Jailhouse rock, news, Pat Priest, Republican, Songs, Tom Delay. Bookmark the permalink. 3 Comments. Money laundering break—that’s classic! It’s nice to see our judicial system still can function. Can’t DeLay fight this all the way to the Supreme Court? Scalia and Roberts would surely rule that he’s a corporation, and, as everyone knows, you can hardly throw a corporation into the klink. Easy! go to jail card for tommy.